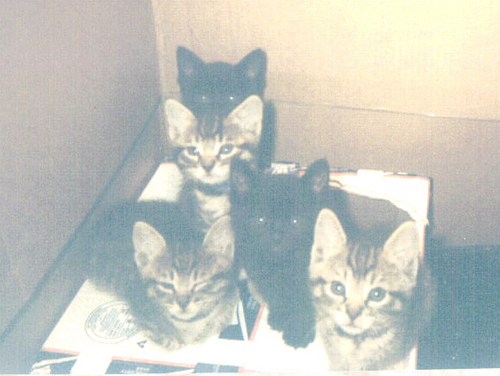 This is a representative sampling of one of the feral kitten litters my ex and I fostered over the years. He'd grab them at about 4 weeks, if he could, wearing thick gardening gloves. They'd be potato-sized hissing balls of fur and teeth and claws, then within 3 days, they'd figure out that life in captivity had definite advantages: Hey, it's warm and comfy! I don't itch with fleas and ticks! I get great food! Then they went off to the SPCA and loving homes in a few weeks. Eventually, all the neighborhood ferals were trapped, spayed or neutered, and re-released back to our neighborhood where they were fed and roamed at leisure. No more kittens. Good news, but I missed them just the same.